My brother has been racing since he was 3, so that motivated me at first to get on a bike. Then my mom and dad bought me a bike in 2015 which got me into racing. That’s such a tough question to answer. In my opinion, any girl who gets on a bike and tests their luck on a track is paving a path for every girl out there. I do, however, really look up to Dominque Daffé. She is always so positive and encouraging everyone to train harder and ride faster. I can also relate to her in the way that we’ve both had some injuries that have impacted our riding ability but no matter what she always pushes through and keeps riding. That’s extremely inspirational and motivating to me. Jacey looks up to Ashley Fiolek and hopes to do another of her MX Schools in the future. Well, all of us know that men are built much different than women. Picking up a bike from the mud, loading it into the back of a truck and throwing it around like most of the guys do is much more challenging for me at least than I think it is for most guys. It also doesn’t help being short (Laughs). I couldn’t say, honestly. Guys push you because when you’re beating one of them you feel like a badass, but racing girls is a whole other ball game. A lot of us are no less aggressive than the boys and it gets intense out there battling for the spot you want. It is awesome lining up next to 30 other girls and knowing that nothing about the next 20 minutes is going to be easy. Ashley Fiolek. She is so selfless and encouraging to all riders. She has overcome so many obstacles and is at the top of the game. I did a riding school with her once and learned so much! Within 4 hours, I was already 100% better at everything I was doing on the track. I hope she comes back to BC so I can learn more! Jess Pettis. I’ve known him for quite a few years now and the hard work and dedication he has put into this sport is inspiring. And it shows as he is now at the top of his game. I would love to be able to accomplish even half of the things he has. When it comes to racing, my brother, Carson McQueen. He has accomplished so much and pushed himself to compete at the top of the Pro class. His last couple years of Nationals have been tough. He got landed on in Nanaimo a couple years back and broke his collar bone off the start in Prince George last year. Though, this doesn’t stop or scare him from working hard and trying to win. Well, on June 26/18, I had an ankle surgery repair from a previous crash. It has been quite the challenge getting back on my feet and doing the things I love. Luckily, I have only missed a couple races and will be back to 100% in the new year. I’m also going to school which will definitely be taking up a lot of time. Luckily, classes end in April so I’ll be able to race all the nationals and almost all of the MCQMX races, given I’m healthy and not working every weekend! Injuries have impacted a couple of my seasons so far but that hasn’t stopped me. I got on with Motovan this year which was huge for me! We all know how expensive it is to pay for parts, gear and racing so this help and support was amazing and super helpful! Last year, I was 3rd overall in the MCQMX South Series and 2nd Overall for the MCQMX North Series. In 2017, I finished 2nd overall in the MCQMX BC Championship Series. I also finished all nationals this year without getting hurt!! Woo!! Don’t give up! Everyone has bad races, but don’t let that stop you. Don’t let the game beat you down. Push through, train harder and don’t let anything or anyone stop you from trying to reach your goals. 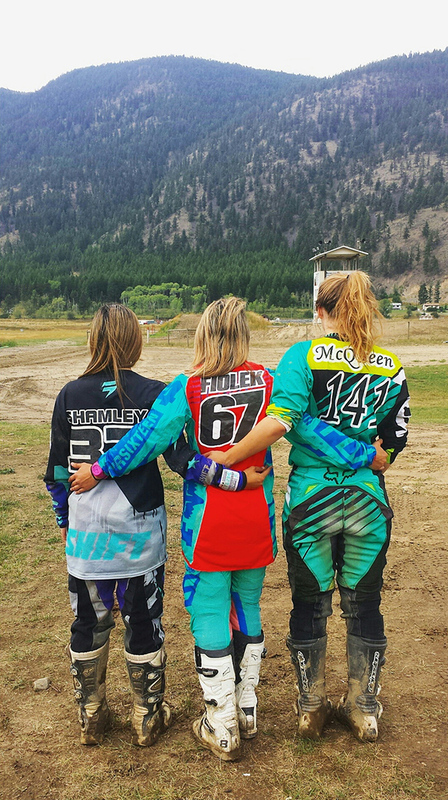 Female racing is growing, but is still not even close to what Men’s Motocross is. Trying to afford everything takes a toll on your bank account, especially when the type of sponsorship some girls need is not there. I think family is a huge thing, too. Trying to manage all these things can be almost impossible so its very understandable why a lot of girls leave the sport earlier. Never say never. I think to achieve this, a woman would need to dedicate her entire life to Motocross but it is totally possible. I would be thrilled to see this happen. Hell yeah! I know a lot of parents who race say they will never get their kids into racing because of how dangerous it can be and how hard it can be on your body, but I can’t wait to buy little motocross gear and watch my little bobbleheads race with all the other kids. Motocross is a family sport and you always see families sticking together through all of it. I only hope that they will enjoy it and want to continue as much as I want them to! First of all, thanks to you, Jeff, for giving me this opportunity. But most of all, I’d like to thank all of the people that make this possible: my mom, dad and brother of course and the family company MCQMX, a huge shoutout to Valley Moto Sport West Kelowna for hooking me up with bikes and parts whenever needed, Motovan and Shot Race Gear for all the awesome looking product, RMR Suspensions for always having my bike race ready, Lime Nine for the creative decals, thank you to Suzuki Canada. I also couldn’t do this without my boyfriend, Kristian, for getting me to all the races. Thank you again to everyone, I couldn’t do any of this without all of you.